We begin our trip when Martina and I meet in Seattle–after her month in Munich–and pick up our new/used Toyota. Joining us are Mike and Jan whom we met in Antarctica. We start with a drive across the North Cascades. I cut my teeth climbing these towers in the 1960s with Fred Beckey. We pushed a very nice route up the center of the South Early Winter Spire (left tower) over the summer of 1968. The North Cascades highway was under construction that summer and Fred and I decided to climb a few of these classic faces before the hordes descended. Just before the road opened to the public in 1973, I skied this route from Western to Eastern Washington in a three day push across the last of this virgin wilderness. I forgot to pack my foodbag and subsisted the entire trip on about a dozen frozen hamburgers that I picked up at the last burger stand in Marblemount….but I digress…. Speaking of cold hamburgers, next stop is Chico Hotsprings enroute to the Yellowstone Plateau and Jackson Hole Wyoming. In addition to it’s Olympic-sized naturally heated hot pool, this place has a Hamburg Steinway in the front lobby. After about twenty years of staying here, when I ask for the key, they hand me the one for the piano, not the room key. Boasting a 5 star wild game restaurant (try the Hutterite Duck or Elk Medallions) and a wine cellar that would make most Frenchmen weep, it’s a must-stay if you happen to drive between Livingston and Gardiner Montana. On to Jackson Hole where we find a moose with her twin calves in our front yard. We’re there only three days hosting a Jenny Lake Ranger reunion commemorating one of the finest people I’ve known and worked with, Pete Hart who died of cancer last Christmas. On to Southern Utah….the best kept secret when it comes to red rock. We are now hauling our Bambi behind our Toyota as we near Capitol Reef National Park in Torrey Utah. Decked out with Navaho Sandstone overlaying Kayenta Sandstone, white domes greet us with every turn of the road. 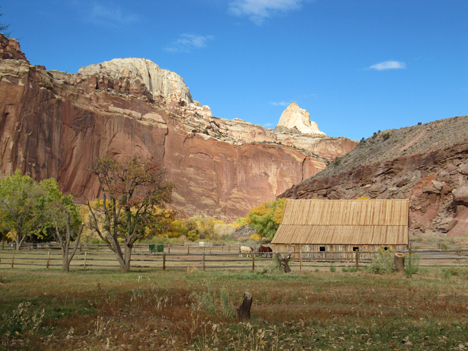 In the center of Capitol Reef National Park winds the Fremont River which attracted ten Mormon families in the late 1800s and who occupied the town of Fruita until about 1960. You can still buy fresh baked pies (perfect for a campers breakfast!) just a short walk from the campground in the old cottonwood groves. We stop for all flute shops! In the center of Capitol Reef National Park winds the Fremont River which attracted ten Mormon families in the late 1800s and who occupied the town of Fruita until about 1960. You can still buy fresh baked pies (perfect for a camper’s breakfast)! Just a short walk from the campground in the old cottonwood groves. On to Bryce Canyon–we’re working our way south and ‘digging’ our way down through geology to the Grand Canyon below. Canyon is the typical eroded uplift that practically dissolves in front of your eyes but it was 20F degrees with 40 mph winds so we move south to Zion in search of warmer hikes. We finally drive south past Lake Mead (dry, dusty and desolate) onto the salt flats of the Mojave Desert to Palm Springs. Enroute we encounter Amboy, now nearly abandoned on the old Route 66. I wonder if our Bambi Airstream has ever been here before…. Even Palm Springs has some good hikes although after hearing of 120F temperatures, I began to doubt it. East about one hour’s drive through wonderfully kept irrigation farming, we wind our way up into the Mecca Hills to Ladder Canyon. After a week in Palm Springs (where I attended a three day conference of the American Institute of Oral Biology), we fly north to Seattle, then Bellingham where we catch the Malaspina Ferry to Alaska. It’s a stormy passage north as the November storms sweep into Queen Charlotte Sound and Dixon Entrance. Here an AML barge/Western Towboat combination works it’s way south with half of the containers obscured by a wave trough–note the 50’+ waves ahead of the barge–about 5 miles distant…. It’s a heck of a ride–all our household items were shipped on AML when we moved north, including the grand piano. This entry was posted on Sunday, November 15th, 2009 at 7:06 pm	and is filed under Alaska, Ranger Doug Roadtrips. You can follow any responses to this entry through the RSS 2.0 feed. Both comments and pings are currently closed. A great journey you had down south. I remember Bryce and Zion from a 1976 trip with Helen, love your writing, if my English was better, I would write my travel blog in English. You’re my new hero. I’d first read your name when examining the fine print of that silkscreen poster I bought at Yosemite many years ago. Then I read about how you brought a whole bunch of these things back from extinction into our collective consciousness – long before the simple beauty of WPA posters became hip again. Next I browsed through your blog and found the Katahdin, the travels, and of course the log home with the I-can’t-believe-it ain’t-a-Hollywood-backdrop views. Well the road trip with the ’61 Bambi tops it off. You’re living a picture postcard view of the American Dream, one that you and Martina have written elegantly and uniquely in your own image. Compressed down into one website as it is, it’s honestly, truly difficult for me to understand how you pack so much living into a single life – and it’s incredibly inspirational. If you two ever make it to the Chicago area, please oh please look up Melissa and me. We’ll take you out for a slice of deep dish pizza, give you a tour of our ’62 Globe Trotter and get your feedback on my own series of travel-style posters I’ve been working on. All the best in 2010!